A Lego custom designer called Gobie has built three space ships based on the iconic craft associated with Electric Light Orchestra, Boston and Journey. We already have the official The Beatles’ Yellow Submarine, but Grobie has gone further, and has created Lego versions of ELO’s iconic space ship, the craft seen on the cover of Boston’s debut album, and the Scarab ship that adorns the sleeve of Journey’s classic Escape. The ships area accompanied by a miniature musical figure of: Jeff Lynn, Tom Scholz and Neal Schon. This LEGO version is a hand-held, “swooshable” version of that ship, complete with a cockpit that seats Jeff Lynne and his guitar! Thrusters on the bottom enable successful landings and takeoffs from any interplanetary surface! 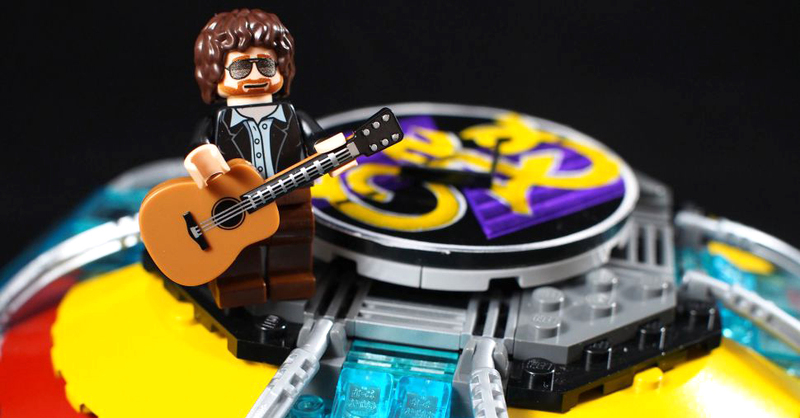 The Jeff Lynne minifigure sports his iconic large round sunglasses and shaggy mane. This Lego model preserves the entire floating guitar design, but with the ability to easily detach and re-attach the saucer section from the neck!. All three designs can be supported at ideas.lego.com, a site where AFOLs can submit Lego their prototypes. If they get enough support, the Lego company goes into production. For more information, visit Grobie’s website.